At Sage Pay we understand that processing payments online is constantly changing; from the way people pay, to the devices they use. With payments now being processed on computers, tablets, phones, and other mobile devices we know having payment pages with a consistent look and feel is critical to you and your customers. Our new responsive payments will provide you and your customers an adaptable payment process that will automatically react to the device your customers are using. What do the new pages look like? Our responsive payment pages have been redesigned to improve the look and feel of the payment process your shopper will experience when making a purchase. Each page has been designed to react to the device that is being used to ensure you customers have a smooth experience every time they purchase from your website. Important - the 3D Secure pages will continue to be part of your payment process but these pages will not change. As we do not control the 3D Secure pages we cannot change the way these look and feel. The improvements have been made to the design of the pages, and the way they will display to your customers regardless of the device they are using. Although the display may vary slightly depending on the device – to give your customer the best possible experience, the layout and colour scheme will remain the same throughout. 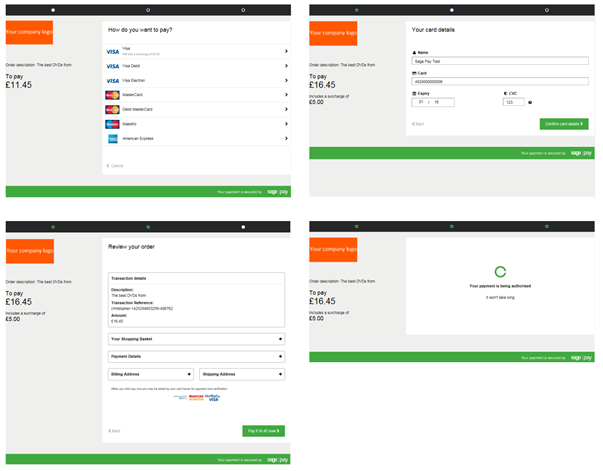 Below is an example of the payment pages on a computer/laptop, a mobile phone, and a tablet. These are the pages that most customers using your website will see. Each page has been re-designed to streamline the transactional process and clearly identify what information is needed from your customers. You can add your company logo to your payments pages and it will be displayed to your shopper on each page they see. If your customer is making a purchase using their mobile phone you will not need to adjust your payments pages to make the experience user friendly. The new responsive payment pages will identify the device that is being used for the transaction and adjust the payment pages to the dimensions of the phone automatically. The only difference with the mobile phone payment pages is your company logo will not be displayed on these pages. 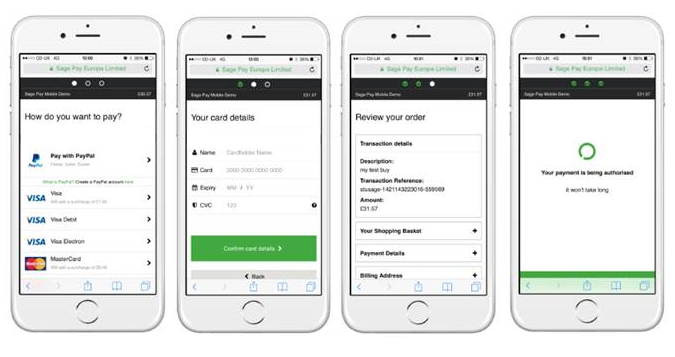 In order to give your shoppers the best possible experience, and all of the information on the screen at any time we have disabled logos from being displayed on the mobile phone payment pages. When using a tablet, the pages will look very similar to the desktop computer/laptop payment pages. The only difference between the 2 is the size. When using a tablet the screen is smaller than that of a browser window on a computer monitor. The responsive payment pages will react to the specific tablet that is being used and display the payment pages to your customers in the correct size. Can I customise these pages? The new responsive payment pages do not have any customisation available at the moment. We have yet to define in which ways you can change the look, layout, or colour scheme of the new pages. If you have any requests, or request on changes you would like to make on our new pages please let us know. If you would like to have the address as "Read ONLY" on your payment pages you are not currently able to do this with the responsive payment pages. We will be releasing versions of the responsive payment pages moving forward - with additional features and functionality however at this time there is only a single version of the pages - with no customisation and no ability to have read only. To have address read only payment pages you will need to use the older versions of our payment pages. Who can use these pages? If you are currently using Sage Pay's Customised Payment Pages you are able to change to the Responsive Payment Pages without any problem. You will however lose the customisation that you have on your payment pages when moving over to our responsive payment pages. Find out here how to activate these payment pages on your account.